Chief of Naval Operations Adm. John Richardson holds an all hands call onboard the Navy’s forward-deployed aircraft carrier, USS Ronald Reagan (CVN-76). US Navy photo. The Navy’s top admiral told sailors in the Pacific area of operations to expect more combined exercises in 2018. In a wide-ranging town hall held Tuesday morning local time, with about 1,000 sailors aboard aircraft carrier USS Ronald Reagan (CVN-76) in port in Yokosuka, Japan, Chief of Naval Operations Adm. John Richardson detailed his vision for the Navy in 2018. “What I want to do, particularly in 2018, is more time in these exercises working toward the high-end of naval warfare,” Richardson said. Naval exercises throughout the year and around the globe provide allied and partner navies a chance to learn from their U.S. counterparts, but Richardson said U.S. sailors benefit from the exchange of ideas occurring during these bilateral and multilateral operations. Richardson recalled a recent large-scale international exercise involving three U.S. carrier strike groups. 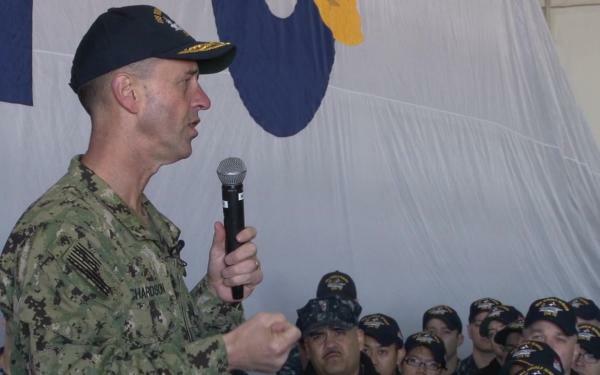 The U.S. Navy hasn’t fought alone, Richardson said in the Reagan all hands call, stressing that cooperation with other navies is vital to addressing threats in the U.S. 7th Fleet area of operations and elsewhere around the globe. Ongoing concerns about North Korea’s string of missile tests and statements made by leadership in Pyongyang, provided a current and nearby example for Richardson to highlight the need for cooperation with allies. “This is an unprecedented and urgent threat we’re seeing from North Korea,” Richardson told the sailors. Richardson cited as an example the recently conducted Multinational Mine Warfare Exercise, held off the coast of Korea with Republic of Korea Naval forces and U.S. mine countermeasures ship USS Chief (MCM-14). This exercise included training drills designed to improve cooperation and proficiencies among the navies in mine countermeasures operations, according to a statement released by the Navy. “The security environment got more demanding,” Richardson said aboard Reagan. Richardson said that a year from now, when looking back on 2018, he wants the Navy’s story to leave no doubt in the minds of both allies and foes about its capabilities. “There will be no more dangerous place than to be in the crosshairs of the United States Navy,” Richardson said. While in U.S. 7th Fleet, Richardson met with sailors from mine countermeasures ship USS Chief (MCM-14), guided-missile cruiser USS Shiloh (CG-67), amphibious assault ship USS Bonhomme Richard (LHD-6), U.S. Naval Forces Korea (CNFK), and guided-missile destroyer USS John S. McCain (DDG-56), which was severely damaged in a fatal Aug. 21 collision with a merchant ship. Ten sailors were killed in the incident, one of four serious 7th Fleet mishaps in 2017 which spawned a CNO-ordered Comprehensive Review and a Secretary of the Navy-ordered Strategic Readiness Review. 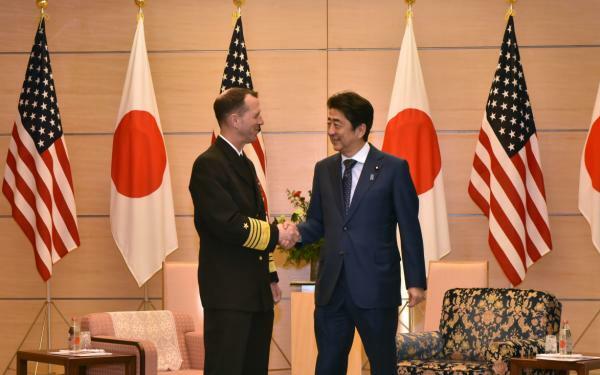 Richardson also met with military and civilian leaders from the Republic of Korea and Japan, including Japanese Prime Minister Shinzo Abe.